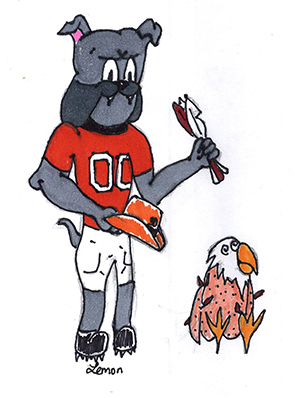 An Artesia Bulldog plucks a Belen Eagle in this drawing by Artesia High School senior art student Maegan Lemon. The ‘Dogs will take on Belen in the 2017 Class 5A State Championship game at 1 p.m. Saturday at Bulldog Bowl. Bulldog Bowl sat silent Thursday afternoon under a gathering bank of grey, late-autumn clouds. The darkening sky set off the accents of bright orange throughout the stadium. Those include a collection of 29 football-shaped insignias along the face of the press box – one for every state championship the Artesia High School football team has won since its first in 1957. Emotions have been palpable over the past week. The Artesia players, particularly the seniors among them, have been reflective. They’ve shared sadness with two teammates over the untimely loss of a young family member. They’ve converted any nerves to frenetic energy, making their final workouts of the 2017 season count. What’s left now is anticipation. Passion. Focus. Determination. For the first time in seven years, the grandest stadium in the state will be hosting a state championship game Saturday. An unbeaten opponent will be across the field. The Sea of Orange will be thousands strong. And the Bulldogs are ready. With a thus-far dominant playoff run under their belts, the boys in orange are confident, as well. They anticipate a battle, and they feel they’re well-prepared for it. They know where Belen has hurt its opponents most over the course of the year, and they’re determined to counter. As all of New Mexico is aware, the bulk of that damage has been done by the Eagles’ junior running back, Diego Casillas. With nearly 2,500 rushing yards to date and 31 touchdowns on 240 carries – a 22-232 per-game average – Casillas is unquestionable Belen’s workhorse, and they’ve ridden him to an unblemished record. “That tells you a lot,” Henderson said. “They’ve not slipped up at all. They’ve had a couple of close calls, going into overtime with Farmington and beating Los Lunas by one point, but they’ve played well this year. Senior quarterback Zach Halterman is capable of keeping defenses honest if given an opening, going 98 of 168 for 1,543 yards to this point with 15 TD passes. His favorite target – Carlos Espinoza – has more than 500 receiving yards to date. On the other side of the ball, senior linebacker Rowdy Robinson leads the state in sacks with 24. At 5’8”, 185 pounds, Robinson may seem an unlikely threat, but with 101 total tackles, Henderson says he’s reminiscent of defenders Artesia has seen come through its own ranks. Saturday’s title game will be a classic battle of air vs. turf. Bulldog senior QB Taylor Null will surpass the 3,500-yard mark this weekend with a completion percentage of .649, 48 touchdowns, and only four interceptions to his credit. Null has five receivers – Tyler Greenwood, JR Bustamante, AJ Estrada, Chaney Hardt and Jacob Orona – standing at more than 350 yards thus far, 42 touchdowns between them. Beside him in the backfield lurks senior RB Robert Fernandez – 106-888-15. Junior Jagger Donaghe waits his turn, as well, with 469 yards on 55 carries in 2017. “Offensively, it’s really just a matter of fine-tuning what we do,” said Henderson. “I don’t feel like we’ve changed a lot over the course of the year. We just have to make sure that we’re polished and ready to go. As for the Orange Crush defense, they’ve been watching the skies over the course of the team’s past few games. The defenders relish the thought of getting back to the grind against the Eagles. Leading tackler Miguel Martinez (150) and sack leader Colin Flood (18) have been potent against the run this year, and the ‘Dogs’ entire defensive front has put their swarming style on display in the playoffs. “We have to make sure we get aligned, and that’s a big part of the battle,” Henderson said. “If we can get in the right spots, we give ourselves a chance to be effective. While statistics can say much, there’s another variable of which the Bulldogs are aware going into Saturday. Belen has never won a state title. This year’s squad feels strongly it could be the one. “You can tell this senior class has been a really good one for them,” said Henderson. “A lot of them probably played against us the last time we saw them in the regular season when they were mostly sophomores, and this is the next group they were looking at as a good group out of Belen. Artesia, meanwhile, will be playing not only for themselves and their city but the memory of Cy Palmer, 7-year-old nephew of Orona and his brother, manager Jordan, who lost his life last month in a car accident. Their helmets will bear stickers Saturday in honor of Palmer. They’ll carry him and the hopes of the City of Champions for a 30th blue trophy when Bulldog Bowl becomes anything but silent.